Paris, France - The massive fire that engulfed the Notre Dame cathedral Monday has forced a Vermont woman to change her plans for Easter. “My mother and I have wanted to go there," said Carroll, a graphic designer for the Roman Catholic Diocese of Burlington. "She's wanted to go there since she was a little girl. I've wanted to go there since I was a little girl. Notre Dame de Paris is one of the city’s most popular attractions, drawing an estimated 13 million visitors a year. A classic of French Gothic architecture, the cathedral contains innumerable priceless artworks, artifacts and relics. 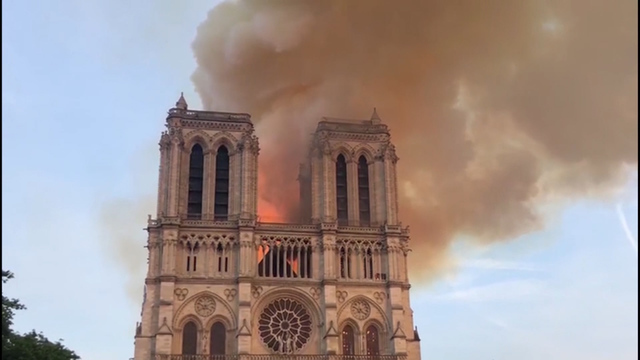 Burlington Bishop Christopher Coyne said he was "horrified" to watch the destruction, calling Notre Dame "such a beautiful piece of architecture and a beautiful part of the church's history.